How to set an image in an Image Control in Windows Phone 7? Windows Phone 7 with it’s simplicity has become really easy to study and code. In today’s tutorial I will show you how to set an image in an image control in windows phone 7. Assuming you have place the image control in the xaml file. I will first show you how to set the image source in the xaml file. 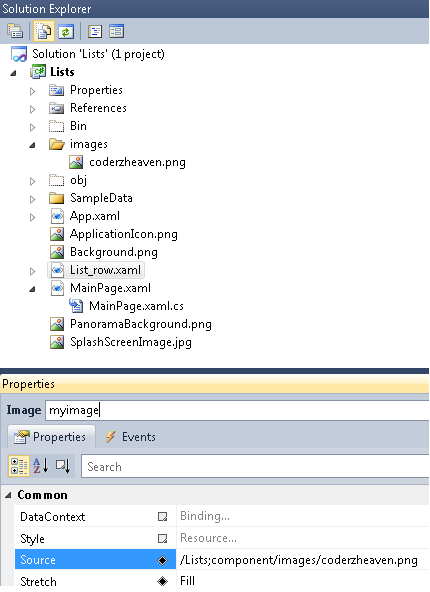 Assuming that you have placed an imaged named “coderzheaven.png” inside images folder in the solution explorer. Now if we want to dynamically set the image in code we do this. Since the result from ConvertFromString is an object we have to cast it to an ImageSource. You can also set it in the properties window of the image. Click on the image control and in the properties window. do this..